King Nambirajan prayed to Shiva for a daughter. One day, while he was in the forest, he found a baby girl. He brought her up as his daughter and called her Valli. When she grew up, Kartikeya disguised himself as a bangle seller and went to her palace. He started talking to Valli. Valli's brothers who were very brave and strong saw this. They did not like their sister talking to a man. When Kartikeya saw Valli's angry brothers, he escaped by becoming a tree stump. Kartikeya went to Valli again, this time disguised as a tribal king, but when he saw her brothers he became a saint and escaped. Kartikeya wanted desperately to ask for Valli's hand in marriage. 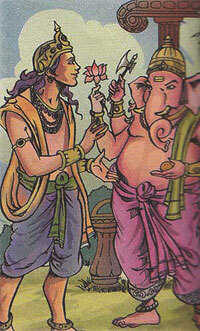 He asked his brother Ganesha to help him. One day when Valli was outdoors, Ganesha disguised himself as a wild elephant and attacked her. Kartikeya saved her life and then asked her to marry him. Valli gladly consented and then got married .